Hyundai Verna beats the Jeep Compass and the new Maruti Suzuki Dzire in a close competition. The better car wins! 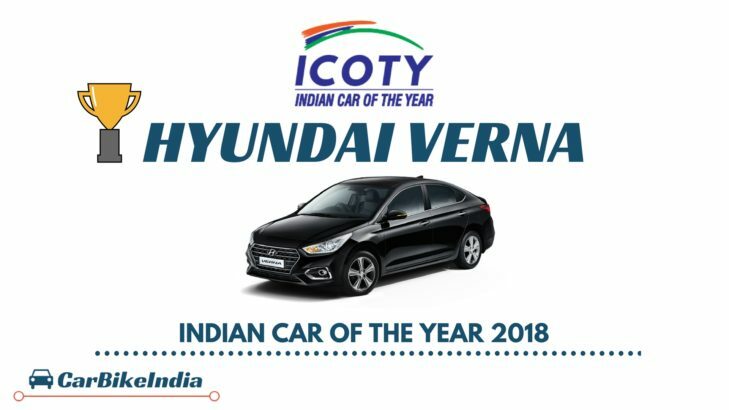 The next-generation Hyundai Verna has bagged the coveted ICOTY 2018 award this time around beating the Compass and the Dzire in the final round. Last year, Maruti Suzuki broke the monopoly of the Korean carmaker and clinched the title of 2017 ICOTY with its Vitara Brezza SUV but the Hyundai is now back with the Verna. The journey to the pinnacle for the mid-size sedan wasn’t easy. It had to meet the challenging parameters of price, fuel-efficiency, styling, comfort, safety, performance, practicality, technical innovation, value for money, and suitability for Indian driving conditions. And then, it had to take on the Maruti Suzuki Dzire, Jeep Compass, Maruti Suzuki Ignis, BMW 5 Series, Isuzu MU-X, Volkswagen Passat, Mercedes E-Class, Tata Hexa, Tata Tigor, Tata Nexon, Honda WRV and the Volkswagen Tiguan. Which it eventually did and the Korean warrior finally emerged victorious. The 2017 Hyundai Verna looks sharper and more aggressive than its predecessor. The updated car is longer and wider too and has upped the sophistication mark as well. It features premium build quality, which has now become a norm with every Hyundai. This time around, a six-speed automatic transmission is also available with both the engine options. As usual, the sedan is loaded to the gills with interesting features like touchscreen infotainment system with Android Auto and Apple Carplay, sunroof, ventilated seats, projector headlamps and foglamps and hands-free boot release. Safety has been upgraded and it gets dual airbags, ABS and ISOFIX child anchors as standard, the top-spec variant gets 6 airbags. If Maruti Suzuki Dzire failed to impress the jury this time around, will the upcoming 2018 Maruti Swift be able to astound them next year? Let’s see who takes the crown for the next year’s ICOTY 2019.